The flow patterns through a catalyst can significantly impact the overall performance of emissions. 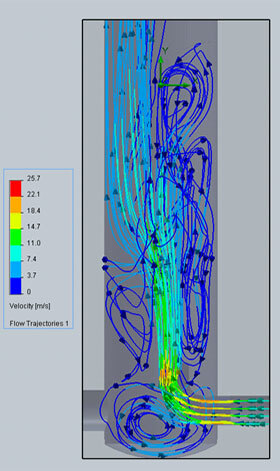 That is why for many new designs DCL conducts CFD analysis of flow patterns through a catalyst or catalytic muffler, to ensure the effectiveness of the catalyst is maximized. An important consideration for many off-road and stationary applications is the high levels of thermal and mechanical stress on the catalyst or muffler. 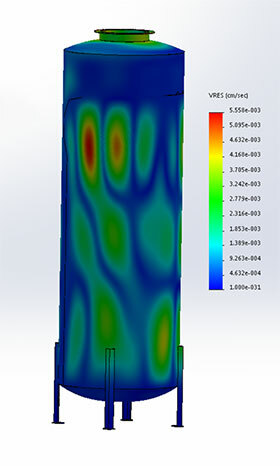 DCL conducts vibration testing for many of its and uses FEA to assess a new design for thermal and mechanical stress. This allows correct mounting procedures to be established and ensures the designs will work without premature failure. Careful specification of the correct catalyst allows the customer to get the most cost effective solution possible, without overpaying for unneeded catalyst. That is why DCL has developed a detailed database of catalyst performance and conversion efficiencies for its different catalyst types. DCL uses in-house steady state and transient catalyst models, including chemical kinetics, mass transfer and back-pressure sub-models, for assisting with application engineering and catalyst design. Statistical methods are used to manage risk so that an optimum catalyst size can be established.